Hammersmith & Fulham’s mix of riverside and urban living attracts a diverse population. Rentify can help you make the most of your letting with our handy borough guide. At Rentify we have property specialists dedicated to Hammersmith and Fulham, armed with local expertise and unmatched valuation knowledge to find you the right tenants. There’s a varied mix of districts to be found in the London Borough of Hammersmith & Fulham. Built-up urban areas such as Shepherds Bush provide a stark contrast to the tree-lined streets of Brook Green. One of the borough’s best assets is its proximity to the Thames, where locals enjoy catching up over a pint or coffee at one of the many riverside pubs and cafes. Cultural types love the live music on offer at Hammersmith Apollo and Shepherds Bush Empire as well as smaller venues across the borough. Many major companies are headquartered in Hammersmith & Fulham, such as Coca-Cola and L’Oreal, drawing plenty of employees looking for an affordable location and a quick commute. The borough is well served by the District, Circle, Piccadilly and Central lines as a well as a couple of London Overground connections. For such a diverse borough, it’s no surprise that there’s a mix of property types to be had. Flats are the main type of housing available, particularly in Hammersmith and Imperial Wharf, whereas Victorian terraces and period properties can be found in more affluent parts of the borough. Hammersmith and Fulham's many districts each have their own character, catering to a variety of residents. Here's our top picks for new landlords in the area. 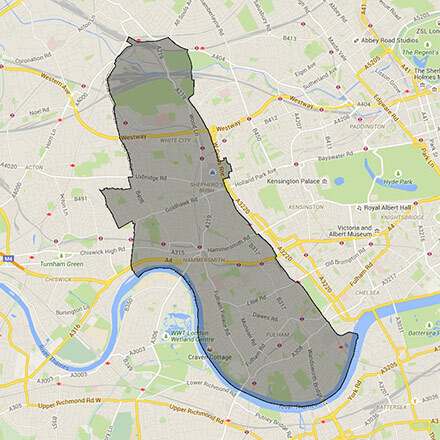 This borough covers the NW10, SW10, SW6, W10, W11, W12, W14, W3, W and W6 postcodes. Rentify uses proprietary methodology for data collection and processing. Borough data is collected from Rentify's property database and external public sources.